1 Preheat the oven to 190°C, gas mark 5. Put the chicken into an ovenproof dish (I use a cast iron one) or a roasting tin about 30cm across. Mix the feta, tomatoes, bread, 4 tbsp oil, garlic and 1 tsp dried oregano together in a bowl. 2 Stuff this mixture into the neck cavity of the chicken, then seal and secure with a cocktail stick if needed. Drizzle the chicken with the remaining olive oil, sprinkle with the rest of the dried oregano, the cayenne and seasoning. 3 Roast in the oven for 50 minutes. Remove from the oven. Sprinkle the orzo around the chicken and pour the stock over the orzo. Put this back in the oven to cook for 20 minutes. Check during this time to make sure the orzo isn’t drying – there should be enough stock, but top it up with a little boiling water if needed. 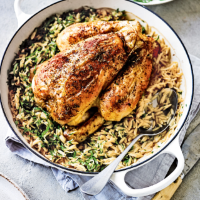 4 Once the 20 minutes are up the chicken should be cooked – check that the juices run clear, with no trace of pink meat – and the orzo should be tender. The stock should also have been absorbed. Stir the fresh herbs into the orzo. Serve the chicken straight from the pan. A green salad or roasted red peppers are all you need on the side.